The gardenias are gorgeous in their blue vase; the other multi vase always looks perfect with whatever flowers you choose. Your pink Echinacea is a fabulous colour. Thank you! This gardenia has a few more buds so I hope there will be a few left for you to see. Those gardenias look absolutely perfect – as if made from very fine porcelain. I loved seeing them. Thanks Ann. This gardenia is producing the best flowers in years. Maybe I pruned it back at just the right time last year (or some other fluke!). They do have rich, creamy petals. They’ve been such a treat this year. What an evocative fragrance you’ve conjured in cyberspace with your photos today . The flowers still look so fresh and perfect ☺Lovely ! I forgot to even mention the fragrance this week, but the flowers carry such a nice aroma. I’ve had one gardenia blossom so far. The fragrance is so lovely. Yours seem to be ahead of mine and so beautiful in your vase. This particular shrub is blooming ahead of my others also. Thank you Susan. Glad you were able to capture the scent. I can understand why you would want a vase full of these beauties…a dream flower for me, and an elegant vase. 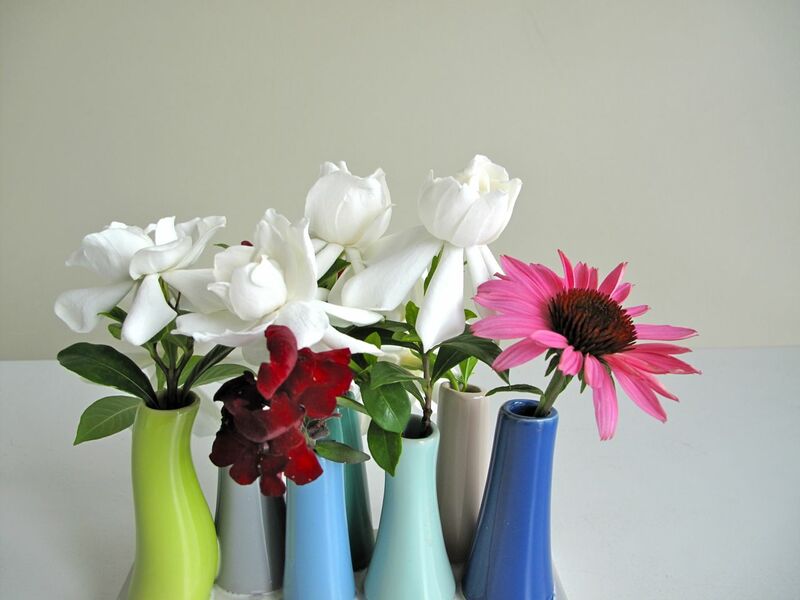 And I love your vases…it looks great with stems of a variety of blooms in your garden Susie! Thanks so much Donna. It’s such a pleasure to have flowers indoors and these special vases make it even more fun. it’s wonderful when things respond to pruning by flowering even better than before – some of my roses certainly do, especially my Rambling Rector which I now know I can cut ALL flowering stems off and it will flower brilliantly the next year. It keeps it under control too. Your multi vase always looks lovely – definitely one to be snapped up if I ever saw it anywhere! Are you excited about having your blogging visitor soon? Pruning is often a mystery to me but I have to cut back this gardenia almost every year. It’s much larger than any of my purchased ones. And yes, yes, yes–I am very excited for the chance to meet Christina. What a plethora of gardenias you have! I love the elegant simplicity of the first arrangement with its perfect props. That multi-stemmed vase is the best of its kind I’ve ever seen. Kris, thank you for the kind words. I really didn’t have time to consider doing anything fancier than just putting the flowers in a vase. These particular ones were all newly opened and at their freshest, so it just worked. Love it when things work out! 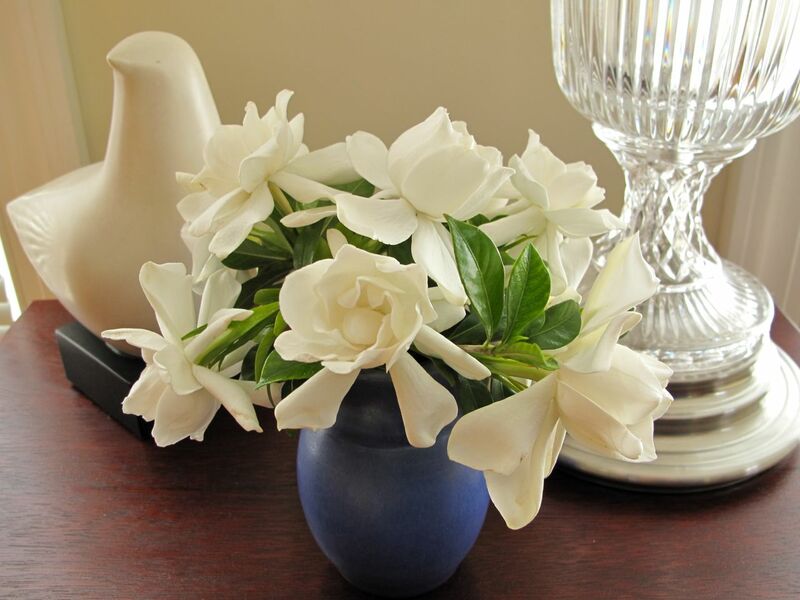 Those Gardenias are so beautiful – they look almost like porcelain! I do love that multi- stem vase and your Echinacea adds a lovely burst of colour. Thanks Cathy, it was lucky to find some freshly opened gardenias yesterday. Many have turned brown already. The Echinacea was courtesy of a vole that must have gnawed right through the stem. Gorgeous, I can smell them from here. What exquisite flowers. Lovely that you are going to meet up with Christina. Thanks so much. The gardenias are strongly scented so I hoped you’d catch a whiff across the Atlantic. Yes, I’m so looking forward to meeting Christina. Both vases are so creative, with very beautiful flowers! Enjoy your week, Susie! Anca, thanks very much. Hope you have a wonderful week too. 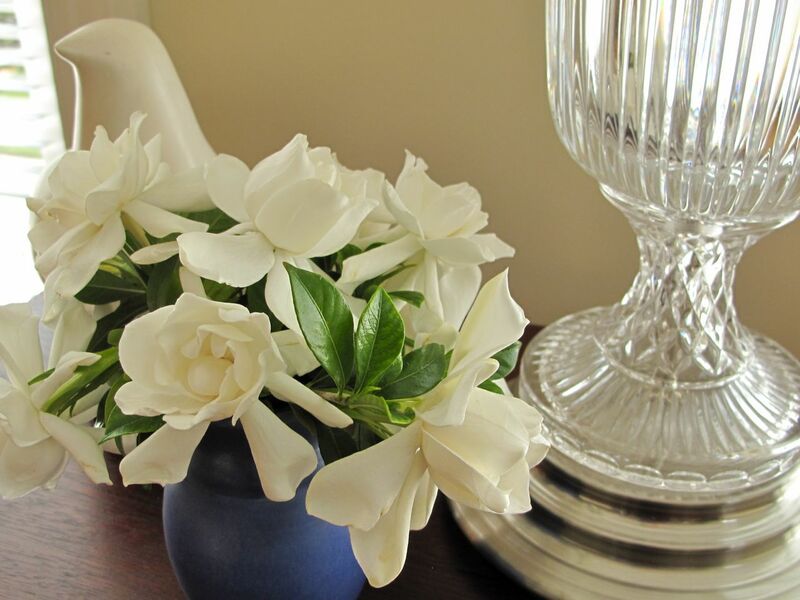 The vase of gardenias looks most elegant and timeless Susie. I imagine that it must smell divine! Thanks Anna. I’m enjoying the gardenia fragrance every time I walk into the kitchen. Your Sunday guests will now think of you whenever they get a whiff of magnolia. That would be lovely wouldn’t it? Scent can form a strong memory. Exquisite – love the 4th photo – purity. Thanks. These flowers were very photogenic this week. 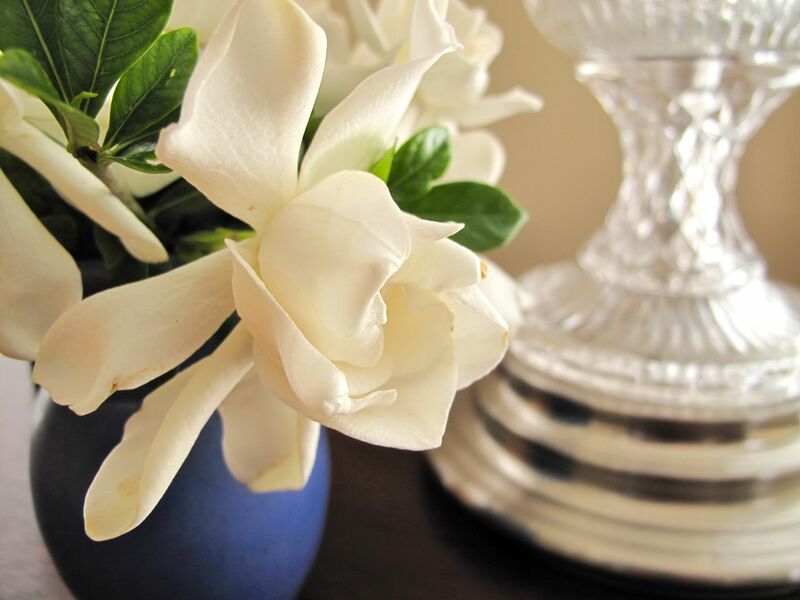 Your gardenias in the blue vase are so beautiful. I imagine they smell heavenly! Hi Eliza. 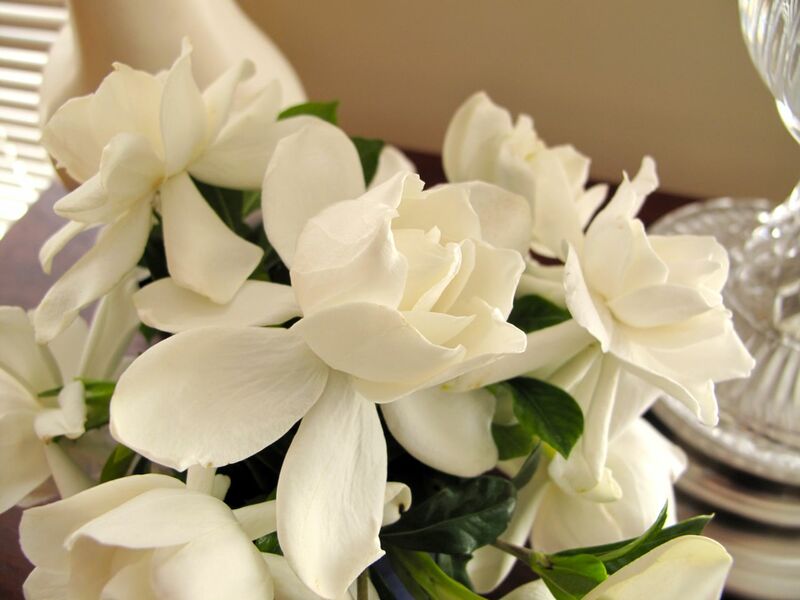 You’re right–the gardenias are wonderfully fragrant. I can’t imagine going out to my garden and picking a gardenia! They are so exquisite, cool and sculptural. The scent must be amazing. The gardenias certainly are a treat. It’s been too hot here so they won’t last soon. Elizabeth, thanks for taking the time. I’m way behind myself. The gardenias are winding down now but certainly have been nice this year. Your gardenias are gorgeous. Just looking at the photos brings back the scent I remember. You set the arrangement next to a crystal vase which makes them look even more regal. Sadly the gardenias turned brown quickly in the heat, but they still smell nice. They are rather regal flowers.